ONLY NINE DAYS LEFT TO SAVE! REGISTER BY 30 SEPTEMBER 2018. Haven't registered yet? It's not too late. Get in before standard prices increase. What does migration look like in the 21st century? Migrant voices in a connected world – a place for advocating social change or platform for online racism? Religion – is it a bridge or barrier to integration? Explore migrant voices in a connected world - a place for advocating social change or platform for cyber racism? 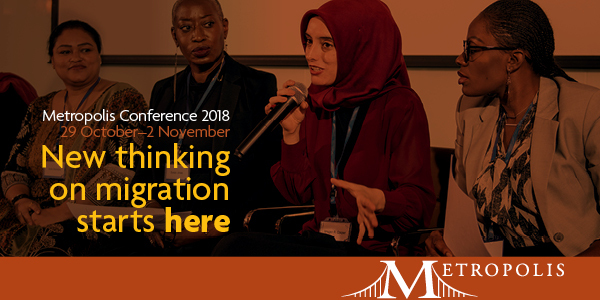 You will have the chance to deep-dive into the complex realms of refugee and migrant-led public discourse on migration with Australian academic Andrew Jakubowicz and global migration advocate and entrepreneur Tolu Olubunmi. As a global advocate for migrants, refugees, and displaced people, Tolu serves on the World Economic Forum’s Global Future Council on Migration. In 2015, Tolu was recognised by the World Economic Forum as one of 15 Women Changing the World. As a Professor of Sociology at the University of Technology Sydney, Andrew Jakubowicz has published widely on ethnic diversity issues, and more recently on topics around cyber racism. Tune into the first two-minutes of Tolu introducing President Obama to the White House. Get inside the inside scoop on the keynotes that we've lined up, the interactive workshops and the after-hours adventures of Metropolis 2018. The International Metropolis Conference 2018 will be held at the International Convention Centre (ICC) Sydney: 29 October – November 2.